All items are fully serviced in our workshop. The internal and external appearance of each radio is restored to the highest possible standards. We stress safety and reliability in all our restoration projects, you can rest assured that any receiver purchased from this page will give you many years of vintage radio enjoyment. 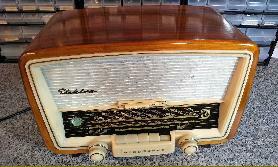 All restoration work is carried out sympathetically, we try to preserve the originality of our radios as much as possible. Each set is sold complete with a simple operating and care instruction sheet, which will help you to get the most out of your new purchase and keep it in 'out of the box' condition. All overhauled radios are sold with a six month return to base guarantee, which even covers the valves and transistors for the full period of the warranty. If there is nothing here that you fancy, why not take a look at the project radio page. There could be something that we can overhaul for you. Prices are listed for this service. If you want to know when we update our radio stock on this page, please send an email to our usual address and request to join the update mailing list. If the pictures seem not to match up to the text or are the wrong size your browser cache more than likely needs refreshing. On Internet Explorer press Ctrl and F5 to remedy this. If you have a twitter account, you might want to follow @pasttimesradio for the latest updates, news about items we have in and other light hearted things going on at Past Times Radio. We have several other projects in development and occasionally some funny tales to share. Our new website will be online shortly. As promised last time around here we have a fully overhauled Bush DAC90, the original octal valved version of this classic design. Nice to find one with a good cabinet and the rarer green print dial, most of this model have a cream printed type. The 90 runs a bit warmer than the later 90A due to the larger valves and heat build up from the dropper resistor, it is important to allow a bit of space at the rear of this model for ventilation, so please don't site it right next to a wall! As is usual on the 90 the rear panel has been repaired, I managed to make a perfect fitting patch out of a other dead DAC rear panel. Great audio and sensitivity, the internal aerial works well and is slightly directional. 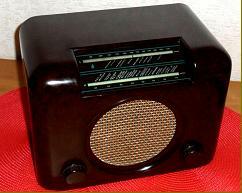 A highly recommended glossy Bakelite wireless. If you would prefer the later DAC90A, watch this space as we have a couple more now in stock awaiting attention. This DAC90 is sold. The two DAC90A's will be ready soon. Here we have a nice condition KB Toaster in its distinctive wrap around cabinet. For a change this one has not been abused which means it is crack free and has not discoloured. KB made this model as a "second" receiver with bedrooms in mind of it's use. Size wise it is very compact and has a small speaker so don't expect audio to the standards of a large valve model however it is still pretty good and not far from something like a Roberts R200. First one we have had in one piece for years! Fully overhauled and ready to go. Price £125 UK Delivery £10 Sorry it has gone. Now resides in California! Every once in a while we get something fabulous to put on the website. Well this 19 valve early receiver from Pioneer is one such thing. I have actually owned this receiver for a number of years but it has not really had a massive amount of use and now due to re-organising my audio equipment into some kind of production "studio" it is no longer required. So here is your chance to get one of the best, little known of valve or should that be tube stereo amplifier / receivers. It is an interesting one too, the output stage uses 2 pairs of ECL82's arranged in push pull, and has all the usual pre-amps and filters that you would expect from a high end product. The tuner is quite special too - it has two completely separate VHF tuners built in. Why? Well in Japan they had stereo transmissions long before multiplexing was invented. The simple solution was to broadcast the left and right channels on two separate frequencies, hence the SMB201 having two discrete tuners. Which I know these days is a bit pointless but it does give the possibility of having different stations in each speaker! Or you can have MW or SW in one channel and a VHF FM station on the other. Inputs are all via good quality phono sockets, you can run auxiliary and other audio inputs through it. Also the record pickup input will handle various cartridge types. Condition wise the cabinet and front is excellent, there is just one small mark on the top panel which has not actually gone through the paint but has left a little line on the lacquer. It is built like a piece of communications equipment on a sturdy steel chassis, weighs a lot and has good chunky transformers for both output and power. All in all one of a kind, and in my opinion a great alternative to leak and quad gear from the same time. Below is a link to download a copy of the user manual which will give you all the details you need. Hope you like the dual magic eyes, no expense spared! This was overhauled when I first took ownership of the amplifier and has been thoroughly serviced again prior to offering it for sale. Be quick, someone is going to snap this up. Antenna - Internal ferrite with sockets for VHF etc. Click this link to download a copy of the owner manual for more information. First released in 1969 the R707 was aimed right at the top end of the market. A direct competitor to Hacker Radio - this was pointed straight at the Sovereign customers. A engineers nightmare, replacing the ever faulty IF module is a long winded painful job. This one has been fully overhauled, all dodgy transistors replaced with something reliable. It's all band and this model is the only one to use a pair of the large 996 6V lantern batteries, which are commonly available. Audio quality is superb - in this respect the 707 is by far the best radio they ever produced. This example has been very well looked after and is in excellent, un-marked condition. Just in case you are wondering about getting your 707 overhauled (does it hiss but no radio signals - that's the IF module) it would normally cost about £75 - £85 for a full overhaul plus delivery. Well worth doing if you like a good radio! Antenna - internal ferrite etc with sockets. Batteries 2 6V lantern types. One for the Hacker enthusiast. White Sovereign II examples are very rare things and this being the A version it is all silicon transistors in the radio side of the electronics. A very good example which has been overhauled and sounds sublime. To be picky I have a couple of things to mention, one is that a couple of the buttons have not aged like the others so they are slightly different shades (in real life the match is better than what is shown here in the flash photos), and if you look closely at the rear panel shot you will see a tiny little mark on one edge of the Rexene covering. I am being a bit over zealous about that bit on the back, it is nothing really. Rest of the covering is in great shape, it still has the original antenna and inside the supplied extension jack plug is attached to the telescopic aerial as they all were on exit from the Maidenhead factory. The handle has all the correct trim and infill in place. Top radio. 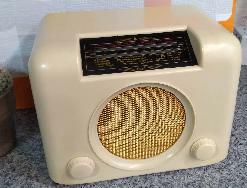 Roberts beat Bush to the first British radio using an IC award hence the name RIC-1. 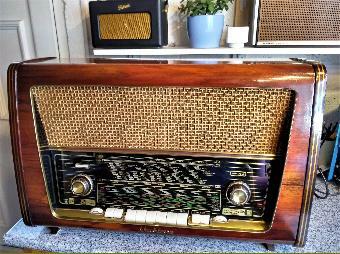 So any radio enthusiast really ought to have one of these. Performance and sensitivity are excellent and the battery lasts for ages. Good one for the Cricket or BBC 5 Live, or anything else on LW and MW. Mint example. Antenna - internals with sockets. One of the last proper British made portables from Roberts this R550 has had a quiet life. The 550 is the larger, much better audio quality version of the Roberts R250 Revival and actually sounds like a Roberts should! Styled on the 1960's R500. Finished in dark burgundy, in excellent condition. Overhauled and ready to go. 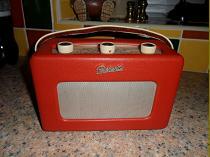 Yes I know it is not an old radio but it is British and we have to support these things! Operated from a single 9V PP9 battery or with the supplied mains adaptor. We repair a lot of the R250 and R550 revival range of radios and carry a good stock of the parts for these models. The only bit that is impossible to get now are the original telescopic antennas however we have one that is better quality and very similar to fit. If you have a dead revival and would like it to be resurrected do drop us a line. This only applies to the analogue models, Roberts Technical will repair the DAB and current versions. Items awaiting restoration, currently prepared to order. Pictures will be available of things once they have been overhauled - basically drop us a line or call to discuss if you are interested in any of them. The quoted prices do not include delivery costs. Available to order now, will be on the website soon. All fully overhauled. 2 Bush DAC90A Mk1 and Mk2 - both excellent clean examples. Ready soon £160 each. Might be a couple more shortly too. 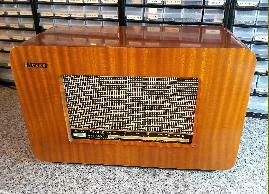 See the DIY projects page for more valve radios - we can always overhaul one of them for you. We are on the lookout for another collection of domestic wireless sets. Any offers? 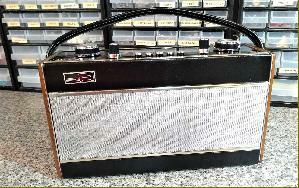 See the DIY projects page for more transistor radios - we can always overhaul one of them for you. For interest and to give a better idea of the items we often have for sale, here is a selection of our recently sold radios. If there is something below that you particularly like do get in touch as many things we have in stock never get as far as this website. This is an interesting one too. Although built in the same cabinet as the more common Roberts P4D model the chassis is totally different. It is a true AC only set with full size octal E30 valves, a mains isolating power supply and standard 6.3V heater filaments. Which all means no battery valves so the audio quality is considerably better than any other the other larger Roberts radios of this time. Time warp condition, the photo at the bottom of the chassis internals was actually taken before the radio was overhauled. One for the collectors, I doubt there are many better examples of this model out there. Really tempted to keep it for the workshop display! Antenna - internal frame with sockets for external aerials. Sorry this classic Roberts has gone. Sold. Everyone should have a DAC90A - possibly the perfect present for someone who has everything! 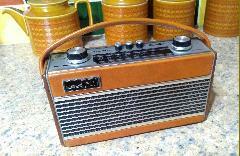 A very popular vintage radio which is compact and easy to use. Simply plug it in, wait 45 seconds and tune in a station. No messing about with aerials or other wires, just try to keep it away from sources of interference. This example is in as new condition, the Bakelite case has a deep glossy leaf patterned finish. Superb. Afraid this one has sold, so have our other four DAC90A radios that were available this past week. All we currently have left is one of the original octal valved BUSH DAC90 models from 1946 which will be overhauled when time permits or we get an order for it. It is another good example. 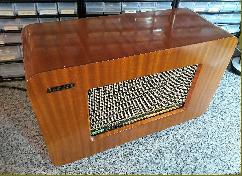 Ok this is immaculate, quite simply the cleanest, most perfect ivory coloured DAC90A I have ever seen or overhauled. It is spotless. Mk2 trim version which has the slightly chunkier control knobs and a green / dark brown dial glass. Perfect working order in factory specifications. Please don't ask us to "upgrade" this to bluetooth, this is never going to happen in the Past Times Radio workshop! Sorry to say this has gone. Sold in a matter of hours. It was rather nice. The brown one was equally great…. Here we have our German radio star. I say star as this is the radio that was used in the production of the BBC Radio 3 documentary "Radio Controlled" which aired earlier on this year on national radio. The entire program is still available on the BBC radio player via the Radio 3 website - look for the Sunday Feature. One of those pictures you see here is the presenter Robert Worby clutching the volks on a windy day last December. I made a little vocal contribution to this too and you can hear me twiddling the radio and making some comments during the program. Well worth a listen (and many thanks again to Andrew Carter who produced the feature, spending hours and hours putting it all together). Well done. Anyway back to this radio. It has been put back into working order and now goes reasonably well. The performance was never so great and it does need a really long wire antenna to get anything like decent reception. As the saying goes, it is what it is. 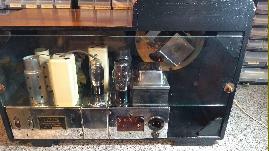 A genuine, 1930's Volks, or peoples receiver. Made for spreading propaganda to the masses. There is so much on the internet now about this type of radio I there is little point in me going over it all again. Condition wise the cabinet and trim are all excellent, it has the proper original spec valves fitted. In use you have to do much twiddling, taming the reaction control and fiddling with the various antenna taps to get a decent signal. It's rather like trying to drive a 1920's car. Lots of manual adjustments to make whist trying to drag BBC 5 live out of the noise. Supplied with a long length of antenna wire to get you going (this will need to go outside). Antenna - LONG wire required unless you live next door to a transmitter. Sad to have to say that this one is sold. Is this the ultimate Pye 9 valve short wave receiver ? It's certainly one of the grandest! With 9 short wave band spread ranges and full MW/LW coverage this work of radio art covers the lot with ease. It has an extra RF amplifier valve up front and as you can see from the photos this example is in very good order. On the audio side you get a pair of EL41 pentodes in push pull configuration. Tone control is by a multi position rotary switch which gives you an indication on the tuning panel - the speaker is huge. That glass plate is too big to be called a dial. Quite often this glass panel gets damaged, thankfully this one is fine. There is also a brand new EM34 magic eye tuning indicator that gives you a wink each time you tune in a new station from around the world. 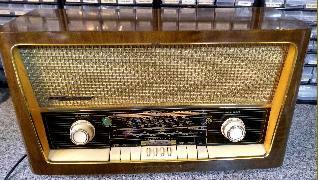 It's a large and quite heavy beast of a radio which deserves a good spot in your house. Would definitely be a talking point! Highly recommended, excellent condition throughout. Price £195 UK Delivery £25 (special job needed for this model in a huge box. The glass panel will be protected). Collection very welcome. EU-- not really happy about packing this up for overseas. Ireland a possibility using DPD. Philips first new UK chassis design released after the end of WW2 they came back with a vengeance. Personally I'd go as far as saying this was the best of all the 1940's Philips, it's a no compromise machine with all the "bells & whistles". First and foremost is the inclusion of an extra RF stage. What a difference this makes too. How many vintage radios do you know of that pick up literally hundreds of SW stations with both the internal and external aerials disconnected ? With just a 6" screwdriver in the aerial socket I was listening to All India Radio on the test bench! The cabinet. 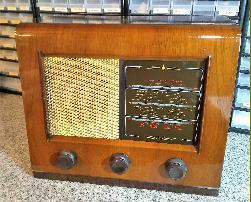 Not so long back in the vintage press it was described as the Rolls Royce of Bakelite radios. It is. Simple as that. All the curves are exactly in the right places and this one is free from any cracks or damage. The Bakelite still has it's original high gloss finish and looks fantastic. The cloth and all other trim is original, in good order. Finally the enamel Philips badge finishes off the front panel in style. 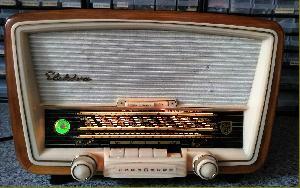 Truly a glorious performing and looking radio, it will beat a "round Ekco" any day of the week in my world. This won't be here long, get it - you won't be disappointed. Fully overhauled. Antenna - internal plate aerial (works very well) with sockets. Price £295 UK Delivery £25 (special) Most of EU £30 - £44 GBP approx. Sorry this is sold. Here and gone in 24hrs! Rightly so, this is one of our top selling valve radios. An attractive little wooden thing - that you find a space for, plug it in and start to enjoy. 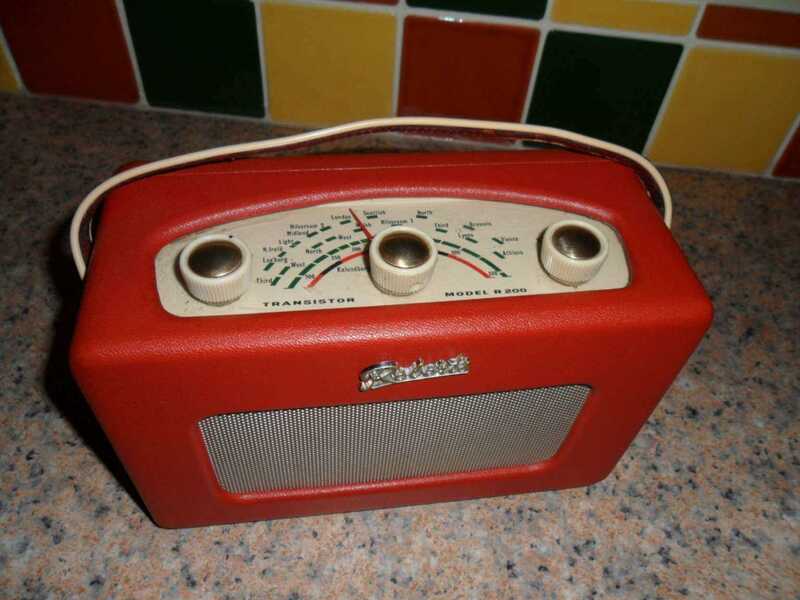 Good sound quality from an ample sized Goodmans speaker, and it's internal frame aerial make this an ideal vintage radio for use anywhere in the house. For SW reception you'll need a length of wire connected to the antenna socket on the back. Fully overhauled and working just as it was 60 odd years ago, with an immaculate original finish cabinet. Recommended to all. Antenna - internal frame for LW/MW with sockets for external. 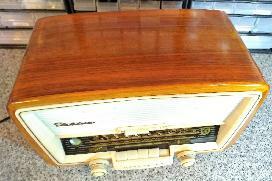 Here we have a nice looking, good performing Bakelite AC valve radio with a painted cream front. One of the better GEC models of the time with decent performance and audio quality on all bands. This one covers short wave too. All in good orignal order bar one thing to menton in that there is some print missing from the centre strip of the tuning dial (this is the short wave bit). I don't think it really spoils the radio as the other two ranges have survived ok on it and with the pointer illuminated behind it everything looks symetrical. Just being thorough with my description! The cabinet itself is in really good shiny condition. The radio is fitted with an internal frame winding antenna which is good for local and strong station reception, a extra wire makes a vast improvement on short wave. Worth having a look at if you fancy a genuine 1940's wireless. Antenna - has internal frame antenna with sockets. Price £130 UK Delivery £14 Most of EU £28 - £35 GBP Sorry sold. Speaking of earlier valved Roberts portables, here is one such thing. A red one too at that which tends to make a difference to some. Again in excellent overhauled order complete with a new set of valves. Unlike many valve portables of that time this one also has an internal mains power supply so there is no need to mess about with 90V batteries. Excellent audio and sensitivity, the antenna is very directional on this model which means you will need to swivel the case about on its turntable to get best reception. One final thing since taking the photos I have removed the little marks on the front grille. Price £95 UK Delivery £10 Most of EU £25 GBP Sorry this is sold. Pilot made some nice looking wireless sets fitted in heavy good quality wooden cabinets. This is one of them - the U suffix does not mean Universal, it does have a proper AC mains transformer just in case you are not familiar with Pilot thinking. Yes they as far as I know were the only company to do that. The clock face dial is particularly ornate and has each relevant section illuminated depending on what band is selected. Good sensitivity and plenty of proper valve audio on tap. Have a look at the pictures for more. We have been busy again in the new workshop polishing Bakelite. It's beautiful. The 371A case was based on a pre-war Philips design, with the chassis slightly modernised with octal EF39, ECH33 etc type valves. Performance is good on all bands with just a short antenna. There is a switched tone selector, one position for speech and the other more rounded position for music. The circular tuning dial is back lit and is fully illuminated when the radio is switched on. 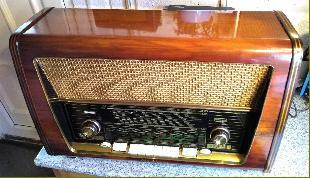 A proper vintage radio which is not too big, looks superb and just the thing to put in your home and enjoy. Antenna - simple external wire needed. Antenna - dipole with sockets for all kinds of things! Price £325 UK Delivery £14 Most of EU £28 - £38 GBP Sorry this went in a matter of an hour or two. 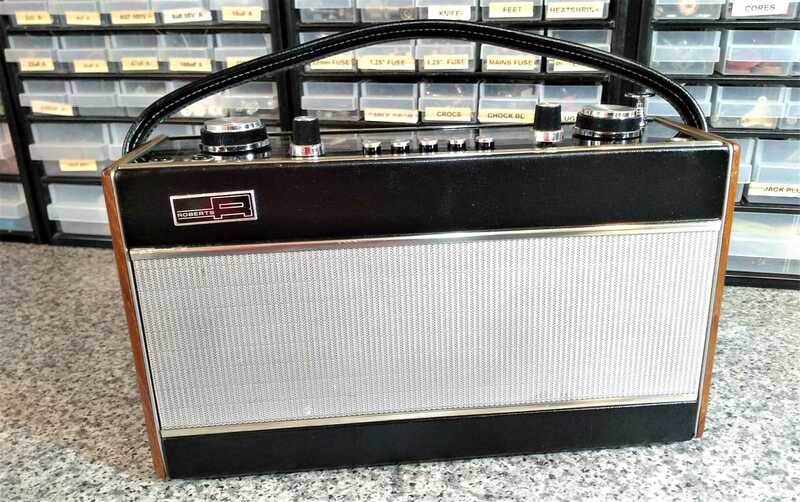 Here we have one of the classic Bush 50's radios, this is one of their best AM models. It is well designed, easy to work on and performs well. The large elliptical speaker does a good job. Cabinet wise this one is very good, factory original walnut with a perfect Bush transfer on top. The birds eye maple trim finishes off the front panel with a touch of class. It has an internal frame aerial which works very well on LW and MW and the stronger SW stations, you need a simple wire aerial to get the most out of short wave. Excellent build and sound quality. 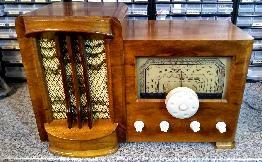 A proper wooden vintage radio. Antenna - internal frame with sockets. Sorry this one is now sold. Tan R200 models always seem to be filthy and are the most difficult to clean. We didn't have that problem however with this one, which I think has been stored away in a box for most of its life. Even the handle is original and in good order - they usually split and need replacing. Great fun and a good sounding proper wood portable. None of that MDF, or self destructing audio amplifier chips in here (take note Roberts!) Later version of the R200 which as always has had its transistors replaced, amongst the other bits that wear out. Not many originals left now in good order like this. Price £80 UK Delivery £11 Most of EU £22 - £35 GBP Sold. Top of the range Roberts radio, the R500 is a bit like a R300 but bigger with a slide rule tuning dial. Personally I think this is by far the best sounding of all the early Roberts radios, it's well up there with the Hacker products. Has an attractive brass telescopic whip aerial which is used for short wave. Roberts didn't make many radios with short wave coverage, I'm not sure why that is. All dodgy transistors replaced. This one is finished in Crimson red. Just as it should be. Antenna - Internal aerials. Telescopic whip for SW. Ext sockets fitted. Batteries 2 PP9 9V types. Price £80 UK Delivery £11 Most of EU £22 - £35 GBP Just sold it. Sorry! For the MW and LW enthusiast, here is a tidy Herald to listen to Europe on. Every bit as good audio as the all singing and dancing Sovereign (less VHF of course), this one finished in a nice blue cabinet with the earlier, more colourful tuning dial. Great rich tone from the huge Celestion speaker fitted as standard in all Heralds of this time. Very clean inside and out. Antenna - Internal ferrite rod with socket. Price £85 UK Delivery £10 Most of EU £25 GBP Sold.